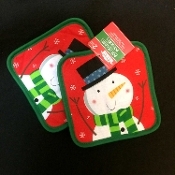 ONE Pair of bright colorful screen printed design features an adorable classic traditional SNOWMAN design on a bright red background, with Christmas Green back and trim. Any winter party, birthday or gathering, will shine brightly with this fun Kitchen set of cooking baking functional decorative accessories! A great Ho-Ho hostess gift for kitchen, dining or bar holiday Christmas party!